Deck design has come a long way in recent years. Now an extension of the indoor living space, decks are built to flow straight from a room in the house to the great outdoors. Deck construction is expected to grow by 2.4% a year until 2016, peaking at a value of $5.7 billion. Real wood is still the most popular material, but due to technological advances in materials, composite wood is on the rise. High design is now becoming affordable for budget minded consumers. These days deck designers are reaching deep in their back pockets for ideas, including mixing styles and materials on the same deck! They are integrating the topography of the existing land into the deck, creating a natural, organic feel. Because of this we are seeing a partnership with the landscaper. 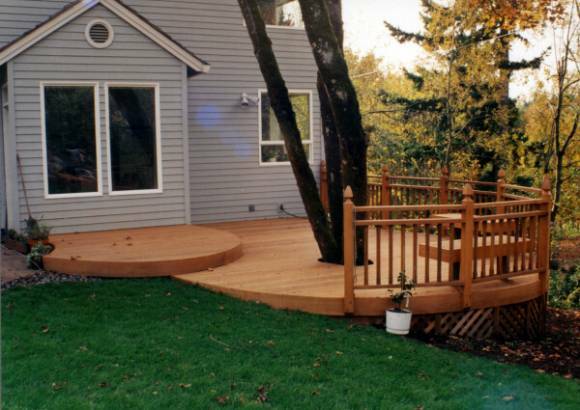 This partnership helps create a harmonious outdoor space that your family can enjoy for years to come without having to worry about trees blocking your new deck view, but instead integrating them into the design, taking full advantage of their structural value. As I mentioned before, indoor living is flowing into outdoor living. Decks are an extension of the home, and people are seeking the same comfort outside as they would have in their living room. This presents unique challenges as well as exciting results. Decks these days are bridging the gap between a sunroom and a completely outdoor space with permanent shade structures, luxurious cushion furniture, and built-in kitchen/BBQ areas. Who doesn’t love to entertain in the privacy and comfort of their own home? As more and more people move to southern climates with mild nights, the need to use the outdoor space at night increases. Because of this, lighting has become a fixture in deck installation; the single flood light just doesn’t cut it anymore. Some designs feature inlaid recessed lighting in the boards, post lights, and lights in the rails. 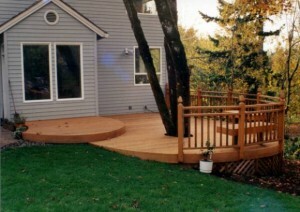 Tip Top Builders will design and build a custom deck for your home. This entry is filed under Exterior Hardscaping and tagged deck construction.